Wolfsbane. This plant had been known in the werewolf world for some time. Lets say you aren’t here to learn about our beloved werewolves, that you aren’t one of those that want to become a wolf; you are in fact on the hunt and are looking for ways to kill these supposed beasts. There are many ways to destroy a werewolf and the use of wolfsbane is one of those ways. As its name clearly shows us, this plant so isn’t wolf friendly; it is a very deadly poison. When mixed with bait and devoured by a wolf, or even put on arrowheads, knives, swords…etc. and then fired or stabbed into the animal’s body, this toxin is fatal. This plant is one of hundreds in the aconite family, as is monkshood. Both wolfsbane and monkshood are related to each other (both are toxic); their significance in folklore is mixed, causing a fusing of ideas. 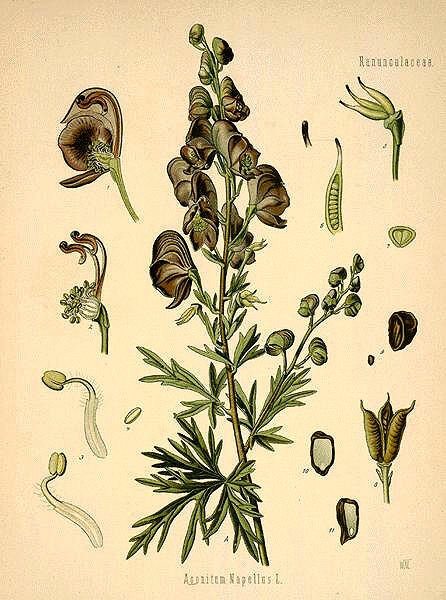 For example, in the werewolf movie Ginger Snaps, a pretty simple mixture of dried monkshood can inhibit the transition from human to wolf, or even reverse it. But today’s post is about the big poison, wolfsbane. In many fictional tales wolfsbane is used as a werewolf repellent, protecting people from the big bad wolf. It can even make a werewolf run away …or die just by the were smelling it or eating it. In the book Kitty and the Midnight Hour, the new werewolf, Kitty, tried to free herself from the curse by drinking some wolfsbane tea on the night of a full moon. But unfortunately for her it didn’t work, all it did was make her sick. But then in the movie The Wolfman it is mentioned that moonlight and flowering wolfsbane are needed to cause the transformation from man to wolf. Now onto the poisonous parts of the plant. Aconite was supposedly an ingredient used by witches for magical ointments. This poison could for sure cause tingling on the skin followed by numbness and it could also cause hallucinations. Now before you crazy kids run off to down some wolfsbane for a good time, this stuff is deadly! You would have to take a fatal dose to get those affects. No part of the plant should ever be eaten, or even touched. Even touching the plant can cause severe reactions to people. Because of the deadly affect on humans, this plant was believed to be excellent against destroying or at least, hindering werewolves. So if you have a werewolf to kill, this should do the trick. In all seriousness though, don’t screw around with the plant!